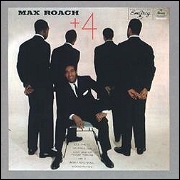 This is the first LP Max Roach has made since death cast a gruesome shadow on his combo in the summer of 1956. The automobile accident that took the life of Clifford Brown, his brilliant young trumpeter-partner, on June 26 last, also claimed the life of Richard Powell, pianist who had been a key figure in the group as its chief arranger. The twin blows were not easy to sustain either on a musical or a personal level. After the initial shock had worn off, Max cast about him to find musicians who would tally with his conception of how the group around him should sound. We will not call them replacements, for nothing can ever replace a gap created by the tragedy that took these two promising talents from the scene. Kenny Dorham, who plays trumpet on these sides, is one of the few musicians in contemporary jazz who could satisfy the exacting tastes of a Max Roach, or for that matter, of anyone who had spent every night for a couple of years listening to the creative soul of Clifford at work. McKinley Howard Dorham, born thirty-two years ago in Fairchild, Texas, has a career in jazz dating back to the Russell Jacquet band in Houston, with which he played in 1943. Succeeding years saw him in the bands of the early bop pioneers, Dizzy Gillespie and Billy Eckstine, as well as with Lionel Hampton and Mercer Ellington. Then came two years with the Charlie Parker quintet, including a trip to Paris with Bird in 1949 for the Jazz Festival. In Richie's chair is Ray Bryant. A Philadelphian, born on Christmas Eve in 1931, he started as a bassist in junior high school. During the past five years he has been heard frequently at the Blue Note club in Philly, where he accompanied Bird, Miles, and others of the jazz elite. Completing the group are Sonny Rollins, whose arrival in the Roach line-up a year ago gave the group a brilliant, booting new front-line sound; and George Morrow, the bassist who now becomes the sole remaining sideman of the original Roach unit. "Ezz-Thetic," with which Max and his cohorts kick off the first side, is a most unusual theme, technically not atonal, although it does give that impression on the firs hearing. It is the work of George Russell, a brilliant young writer from Cincinnati, best known for "Cubana Be" and "Cubana Bop," which he wrote for the Gillespie band in 1947. After the 64-bar theme has been delineated by the two horns, the rest of this nine-minute performance is given to extensive workouts by tenor, trumpet, and piano. Then Sonny and Kenny trade fours with Max and indulge in a little two-horn counterplay before the drums take over the spotlight entirely the last couple of minutes. "Dr. Free-Zee," a short and provocative two-minute item, is Max almost all the way. This is a twin-track recording in which Max is heard on tympani as well as drums; a unique performance that's as dramatic as a blast from a shotgun. "Just One Of Those Things" subjects the Cole Porter standard to an unprecedentedly frantic tempo in an ad-lib performance. The provicative second chorus devotes fifty-six of its sixty-four measures to a series of two-bar breaks by Rollins before he goes into a full solo chorus with the regularly-flowing rhythm accompaniment. Trumpet and piano solos follow, then a brief period of eight-bar trades (at this tempo, fours would be over too soon) leads into another amazing percussionistic workout by Max. "Mr. X," a Roach original, is a minor theme taken at a fast clip, though its 70-bars-a-minute pace seems funereal if the last item you listened to was "Just One Of Those Things." "Body And Soul" gives a slow and tender treatment to the Johnny Green standard, with Sonny and Kenny splitting the first chorus, Bryant and Morrow the second. Sonny goes out on this one with a series of startling cadenzas. "Woody 'N' You" is the Dizzy Gillespie composition first introduced by Diz on a Coleman Hawkins date back in 1943 [Rainbow Mist, Delmark]. The pace is moderate here, affording Kenny, Sonny and Ray excellent opportunities for a couple of choruses apiece on the challenging changes; and of course Max is in there again for a phenomenal finale.